At last the day I'd been dreading for years had arrived. 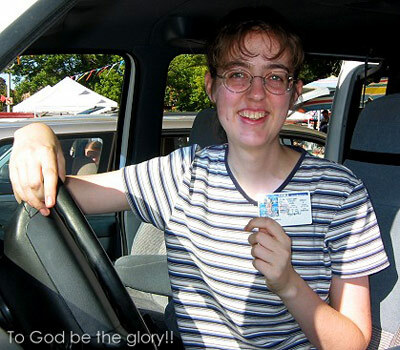 My learner's permit would expire in a few days and I was on my way to town to take the driver's test. From the seat besides me, Daddy offered reassurance. "I'm sure you'll pass with no problems at all; you're a good driver!" I shook my head rather dubiously. Even though I'd been driving over two years, I still lacked confidence when it came to city driving: too much happening too fast, too many things to watch and remember. So there I was, nervously pulling into the DMV parking lot. Daddy and I walked inside and within minutes I led the test lady out to our van. The routine check of lights went well, except for the fact that I initally turned on the windshield wipers instead of the brights (why can't I remember which one is which?). The instructor pulled herself up into the rider's seat and jerked the seatbelt around her stout frame. "Head for the main street," she said gruffly, pointing. From that point everything went downhill quickly...I backed out of the parking space in the wrong direction, going against the traffic arrows; then I barely hit the curb on the first corner. At that point the test was terminated: I was told to go around the block and park in front of the DMV building. Between violent coughs, the test lady informed me that I had failed. She slammed the door and staggered back inside. I was left sagging over the steering wheel, feeling like I'd just been punched in the stomach. I failed, I failed, I failed, echoed through my mind. It was my worst nightmare come true. Why, Lord? I asked You to help me pass this test...my friends were praying...You know how nervous I was about doing this in the first place...How can I try again?...Why did You let me fail? WHY?? The rest of the day was difficult emotionally as I dealt with the failure and tried to learn the lessons God had for me through it. I was very humbled by it all and realized that finding the balance between proud self-confidence and a feeling of utter despair and inability (this self-pity focus is actually a subtle form of pride!) is often not easy. A line from a song summarizes a proper prayer for humility: "I want to see how much I've been forgiven." 2 This realization is two-fold: (1) that I have grievously sinned against God and have no good in myself, and (2) that God loves me so much that He has in His grace and mercy completely forgiven me. This viewpoint guards against both extremes of pride, keeping my eyes on Christ alone. My family was so reassuring through this whole experience--Daniel even bought me a burrito to cheer me up (not many 11-year-olds are so thoughtful!). My online friends offered much encouragement and promised to continue praying. The next morning Daddy said we were going back into town so I could try again. It was the absolute last thing I wanted to do--how could I face all the people there again, less than 24 hours after my failed attempt? I prayed desperately for the humility and courage needed, knowing full well that if I passed it would be only because of the Lord's mercy. Daddy and I arrived at the DMV right around lunch time, so we had to make an appointment to take the test an hour later. While waiting, we did a little shopping and I got some more driving practice around town. When I accidentally ran through a stop sign in the mall parking lot, my confidence was shaken even further and I was driven to seek the Lord's strength as never before. Within ten minutes, I climbed back into the van, still in a daze, and clutching my new license with the gloriously unbelievable expiration date of July 2009. I was more than happy to let Daddy drive home while I relaxed and praised the Lord for answering my prayers. He has also been teaching me the value of facing up to those things which frighten me. Although I want to run the other direction and avoid or postpone the hard things, that's usually not what God wants me to do. As the well-known saying reminds me, "The will of God will never lead you where the grace of God cannot keep you." Even though something looks impossible from my human standpoint, He always gives the strength and courage and wisdom needed to obey Him. Don't just let Jesus be you "co-pilot"--ask Him to be in full control of your life. The road may not be easy...yet as we look back we'll see how He's worked everything out for our best. 2 Hear the song online at BrotherBear.org. This editorial was published in the November-December 2004 issue of Hidden Wisdom Magazine, copyright 2004, Abigail Paul.